I’m not really one for New Year’s resolutions, but I do like to give a little thought as to what my “intentions” are for the year ahead. (It’s the same thing really, but in my mind, I can’t break an intention.) One of the things I want to do this year is use less plastic. I’m going to make a conscious effort to do the three Rs – reduce, reuse and recycle. I’d noticed Hubbub’s #LeedsByExample campaign, which aims to boost on-street collection and recycling of empty plastic, cans and coffee cups throughout the city, and was glad to see an active approach being taken. Unfortunately I wasn’t free for the workshop (I was actually at another very important event that night – a Harry Potter quiz at The Belgrave!) but the team at Hubbub kindly sent me through some top tips for living with less plastic, including mentioning The Jar Tree – Leeds’ first packaging-free store. Plastic was thought of as a ‘wonder’ material when it was first invented in 1869 as a substitute for ivory. Since then 8.3 billion tonnes of plastic have been produced, and because it takes up to 400 years to degrade, most of this still exists in some form. From shampoo to sanitary ware, teabags to takeaway coffee cups and crisp packets to cigarette filters, plastic is now almost everywhere you look. For storing, preserving and transporting food, you can use beeswax reusable wraps, Tupperware and repurposed jam jars. When you’re on the go, take a bamboo spork, reusable coffee cup and reusable water bottle with you so you don’t need to pick up any single-use plastic for your takeaway food and drink. When food shopping, take reusable shopping bags to the supermarket. Try to buy from butchers, bakers and vegetable markets instead of buying pre-packaged goods from supermarket shelves. 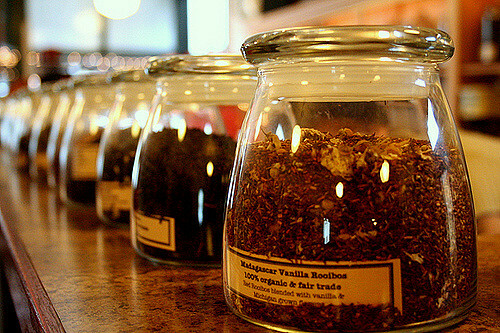 Opt for loose leaf tea, or teabag brands that don’t contain plastic. Shampoo and soap bars such as those made by Hebden Bridge-based Friendly Soap are a great alternative to care products that contain silicone. For baby care, try reusable or biodegradable nappies. When it comes to children’s toys, choose wooden or fabric toys where possible – and have a look in charity shops where there are often some great bargains (it’s for a good cause too!) As children tend to get bored with toys easily, rather than buying new, you could also look into setting up a toy swap with other parents. Coconut fibre scourers and wooden scrubbing brushes work just as well as dishwashing sponges that contain plastic. You can find a range of refillable cleaning products as well as plenty of other plastic-free goods in The Jar Tree in Leeds. When you’re doing the laundry, try to wash at 30 degrees and follow your clothing care label instructions, to avoid plastic microfibres shedding from your clothes and ending up in the waterways. It can be easy to feel overwhelmed, but if you follow Hubbub’s four R’s you can’t go too far wrong! Reduce, Reuse, Recycle and Responsible use.